As many of us know, talking about global warming with those who think it is not happening can sometimes be awkward or frustrating, especially at the holiday dinner table. However, there are often more points of agreement than we may realize. To provide some guidance on constructive ways to talk to people with opposing climate change viewpoints, we analyzed the Yale AP-NORC Environment Poll, a survey conducted among the American public (ages 18 and over) by the Yale School of Forestry & Environmental Studies and the Associated Press-NORC Center for Public Affairs Research late last year. First, who thinks global warming isn’t happening? One in five Americans (20%) thinks global warming is not happening, and it’s important to understand who they are and how they think about the topic. As the poll reveals, they are more than twice as likely than Americans in general to be Republican or Republican-leaning (79% versus 32% of all Americans) and politically conservative (68% versus 30%, respectively). They also tend to be non-Hispanic whites (81% versus 66%), age 50 and older (61% versus 49%), men (56% versus 48%), and religious (44% attend religious services at least once a week, compared to 29% of all Americans). 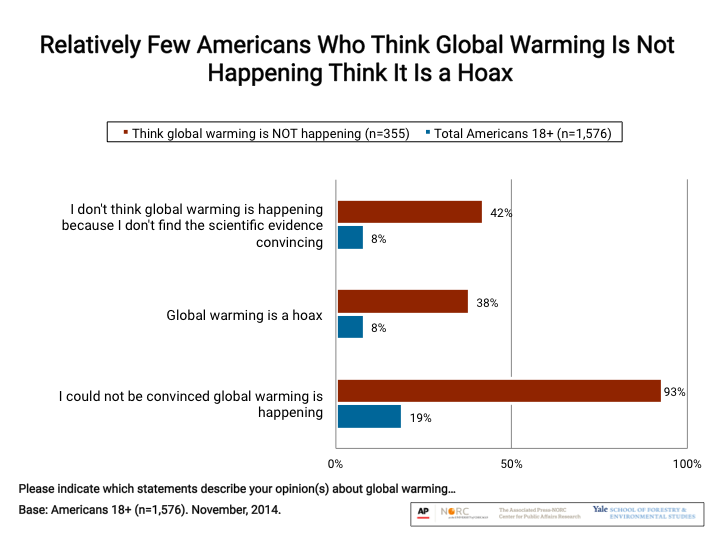 But one of the most interesting findings from the Yale AP-NORC poll is that of those Americans who do not think global warming is happening, only 38% say it is a “hoax.” Slightly more say they don’t find the scientific evidence convincing (42%). Yet virtually all (93%) say they cannot be convinced that global warming is happening and attempting to change their minds through argument is likely to cause them to defend their views even more strongly. So, perhaps it’s best to avoid an unproductive—and sometimes counterproductive—argument about climate change at the Thanksgiving dinner table. While you and a friend or family member may not see eye to eye on global warming, you may share some core values about the environment. For example, over half of those Americans who think global warming is not happening, nonetheless say that it is humankind’s responsibility to protect and care for the Earth and its natural resources (54%), while relatively few (28%) say it is humankind’s right to use the Earth and its resources for our benefit. 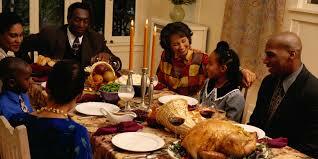 Moreover, there is a good chance you share concerns about issues related to global warming. 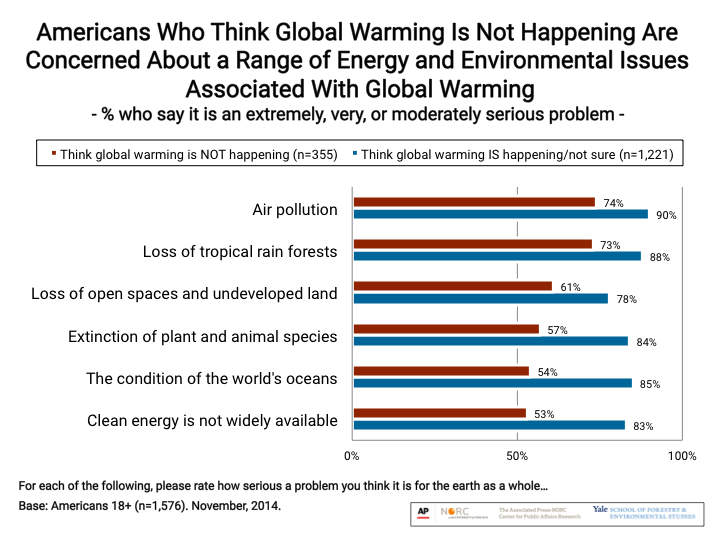 For example, majorities of Americans who think global warming is not happening, nonetheless say they are extremely, very, or moderately concerned about air pollution (74%), loss of tropical rain forests (73%), loss of open spaces and undeveloped land (61%), extinction of plant and animal species (57%), the condition of the world’s oceans (54%), and the fact that clean energy is not widely available (53%). Solutions to these problems can often also help reduce global warming, so talking about how to solve these related problems with your friend or family member could be a constructive way to address climate change without getting into an argument. In fact, you probably already agree about some of the solutions. Our research finds that even those who think global warming is not happening either support or do not oppose funding research into renewable energy sources such as solar and wind power (70%) or regulating carbon dioxide emissions (62%). Moreover, fewer than half oppose these policies. 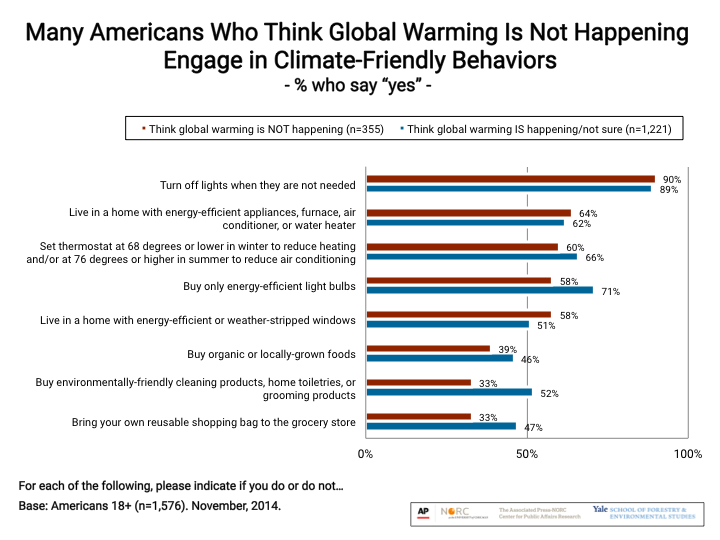 People who say they don’t believe global warming is happening are also likely to engage in a number of climate-friendly individual behaviors that are also good for the pocketbook—such as turning off lights when not needed (90%), living in a home with energy-efficient appliances (64%), keeping the thermostat no higher than 68 degrees in the winter and no lower than 76 degrees in the summer (60%), buying only energy-efficient light bulbs (58%), or living in a home with energy-efficient or weather-stripped windows (58%). Asking for advice about how to save energy and money are topics most people are happy to trade tips about. At least one in three people who thinks global warming is not happening also buy organic or locally-grown foods (39%), buy environmentally-friendly cleaning products or home toiletries (33%), or bring their own reusable shopping bag to the grocery store (33%). So there may be room to talk about the benefits of these activities as well, with at least some people. To be sure, there are areas of substantial disagreement between Americans who think global warming is happening and those who don’t. For example, of those who don’t think it is happening, three in four think “the so-called ‘environmental crisis’ has been exaggerated” (74%) or favor expanding offshore drilling for oil and natural gas off the U.S. coast (74%). 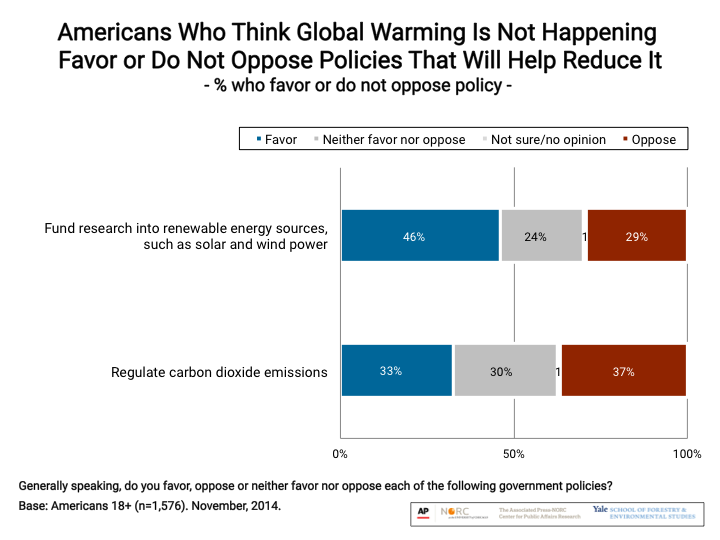 Fewer than half of those who think global warming is happening agree with these positions. But this holiday season, you might experiment and try to find some common ground with those who do not share your views about global warming. There is plenty to talk about—from core values about environmental stewardship to concern about related environmental issues to policy and energy solutions—even if you don’t mention “global warming.” And hopefully everyone will enjoy the pleasure of family and friends over the next few weeks!